Crystal Dynamics have dispatched new screenshots showcasing action from Lara Croft and the Guardian Of Light. 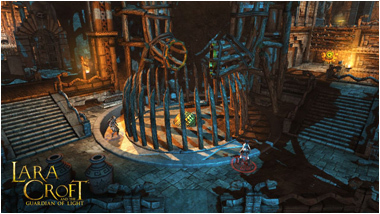 The 6-hour co-op adventure, penned for release this Summer, will be available on Microsoft Xbox 360, Sony Playstation 3 and Windows PC priced $15. Lara Croft and the Guardian of Light is being billed as an isometric arcade game with a fixed camera and an onus on fun. Crystal Dynamics are also working on a second title, a continuation of the Tomb Raider series.